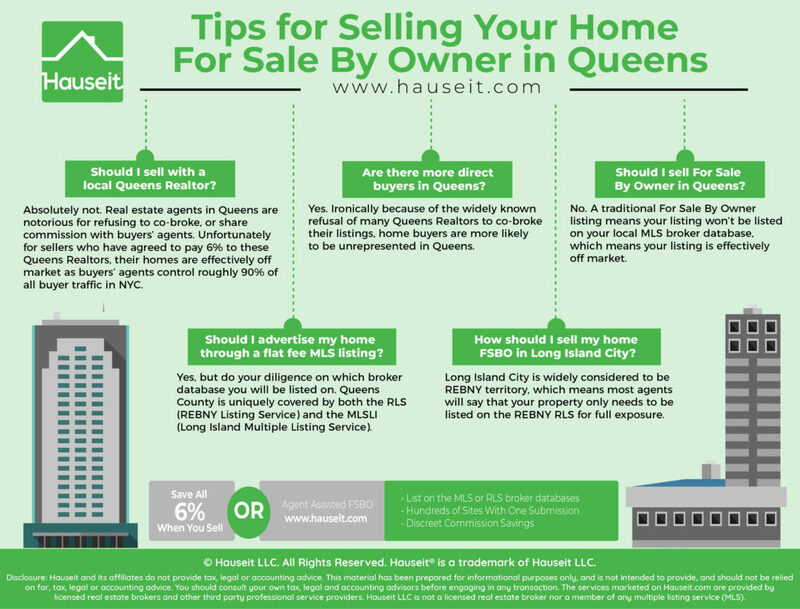 Selling your home For Sale By Owner in Queens is much easier than selling your home For Sale By Owner (“FSBO”) anywhere else in New York City. Listing agents in Queens are notorious for refusing to split commission with buyers’ agents. As a result, FSBO sellers in Queens can get greater exposure than through a traditional Queens listing agent by utilizing a Queens Flat Fee MLS Listing Service. Should I sell with a local Queens Realtor? Are there more direct buyers in Queens? Should I sell For Sale By Owner in Queens? Should I advertise my home through a flat fee MLS listing? How should I sell my home FSBO in Long Island City? Absolutely not. Real estate agents in Queens are notorious for refusing to co-broke, or share commission with buyers’ agents. The above are examples of what Queens Realtors say to buyers’ agents who ask about their listings. Unfortunately for sellers who have agreed to pay 6% to these Queens Realtors, their homes are effectively off market as buyers’ agents control roughly 90% of all buyer traffic in NYC. The reason why sellers agreed to pay 6% in the first place was because their listing agents convinced them that they needed to offer 3% to buyers’ agents to be competitive with other listings, and the listing broker needs to make the same amount representing the seller. Ironically, these Queens Realtors have convinced sellers to pay 6% in order to work with buyers’ agents, yet the first thing these scumbags do is refuse to co-broke in the hopes of finding a direct buyer and collecting all 6% for themselves. Not only is this unethical and a violation of a listing agent’s fiduciary duty to their seller client, it is a violation of New York Real Estate License Law to refuse to honor a buyer’s request for representation by a broker of their choice. Furthermore, the fact that most Queens listings agents will put in writing that they refuse to co-broke is a testament to the incompetence of most Queens Realtors. Why would you trust your home sale to someone who doesn’t even realize they can lose their license for openly refusing to work with a buyer’s agent? Yes. Ironically because of the widely known refusal of many Queens Realtors to co-broke their listings, home buyers are more likely to be unrepresented in Queens. Furthermore, StreetEasy is less popular in many areas of Queens so buyers will have an easier time contacting the listing agent directly on other popular real estate search websites where there is less agent advertising. StreetEasy and Trulia are both owned by Zillow, and all three websites employ a “Premier Agent” advertising program where home buyers are directed to an agent who has paid to advertise on the website. While it is still possible to contact the listing agent directly, StreetEasy very recently has made it much harder to do so. The easiest and most obvious way to request more information on a listing leads you to a random agent who has paid to advertise on a listing. As a result, you are much more likely to sell your home to a direct buyer and save all 6% in broker fees in Queens if you sell your home through a reputable flat fee MLS listing service. Don’t rush out and list your home For Sale By Owner in Queens on the first real estate search website you come across. 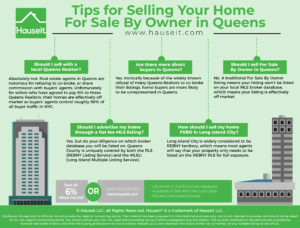 You will face the same issues selling your home For Sale By Owner in Queens as in the rest of NYC. Just because there are more direct buyers does not mean you can avoid buyers’ agents all together. Your listing is still technically “off market” because it is being boycotted by buyers’ agents. Think about it, why would a buyer’s agent risk sending your FSBO listing to his or her client? That buyer client is worth 3% in commission on any other listing, so why would any sane agent risk that kind of payday? Even if you were to sign a FSBO commission agreement before the showing, the buyer’s agent will still be risk averse and unhappy about dealing with you. At any point, the Realtor’s buyer client can simply search for the address of the property and realize that it’s a For Sale By Owner property. Doesn’t that make it awkward for the buyer’s agent? Suddenly, he’s viewed as an intrusive middleman with a specific amount being taken out to pay him. No buyer’s agent wants to volunteer for that kind of situation. next seller client and the occasional exploitative real estate investor looking for a bargain. As a result, by listing your home For Sale By Owner on a real estate search website will only result in hundreds of cold calls and solicitations from Realtors hoping to poach your listing. The occasional direct buyer you’ll encounter will unfortunately be a predatory buyer expecting a significant discount because you aren’t paying any broker fees, and this buyer will be hoping that you don’t understand where property is trading in your neighborhood! Yes, but do your diligence on which broker database you will be listed on. Many for sale by owner websites claim to list you on your “local MLS” wherever you happen to be, whether that’s Idaho or New York City. This is egregious because the relevant inter-broker database will vary greatly from area to area. For example, there is no relevant MLS for New York City as the city’s largest real estate broker association is called REBNY (Real Estate Board of New York). REBNY runs a private shared listings database called RLS and is not affiliated with any MLS or the National Association of Realtors. Just be careful as you can easily pay up to $1,000 on a flat fee MLS listing package only to find your home listed on a completely irrelevant database such as the NY State MLS or the New York State Alliance MLS, none of which are relevant for New York City. It’s also important when selling your home For Sale By Owner in Queens to realize that many flat fee MLS listing services are so ineffective that they might as well be scams. That’s because many of these For Sale By Owner websites and discount brokers make it so obvious what they are doing that every buyer’s agent automatically knows that it’s not a real listing. Note: Queens County is uniquely covered by both the RLS (REBNY Listing Service) and the MLSLI (Long Island Multiple Listing Service). Home sellers in Queens have to ability to list on both the MLSLI and the RLS for maximum coverage through Hauseit! Unbelievably, some For Sale By Owner websites even watermark every listing photo with their logo so that even the most obtuse Realtor will understand that it’s a fake listing. That’s why it’s critical to list through an Agent Assisted FSBO where your property listing will be blended in with the full commission listings of Hauseit’s brand name brokerage partners. Your listing will appear exactly like a traditional listing, and buyers’ agents won’t be able to tell the difference between your listing and other full commission listings. As we’ve learned through years of experience, the only way to get the same full exposure as a traditional broker is to list your home with a traditional broker. The fact that you’re receiving a discreet reduction in commission will be our little secret! Long Island City today is booming with new construction and lots of glitzy new developments offering home buyers “hotel-like” living. As a result, more and more real estate brokerage firms from Manhattan have entered the Long Island City market and now it is firmly in REBNY territory. As a result, it’s critically important that your property listing be included in the RLS to get full exposure to buyers’ agents. Because Long Island City is covered by REBNY and because REBNY co-broking rules are strictly enforced, it’s extremely important when selling For Sale By Owner in Queens to make sure you’ve purchased a flat fee MLS listing package that will get your home in the RLS. Selling For Sale By Owner in Long Island City will be no different than selling FSBO in Manhattan. Represented buyers will account for 90% or more of the total buyer base and you’ll need to learn how to deal with buyers’ agents. Fortunately, through Hauseit’s List Your Home Online listing option, you can post your property on the RLS plus dozens of popular websites such as StreetEasy, BrownStoner, Zillow, Trulia, Homes.com and more all at once!